One of the best upgrades I've recently made to my Printrbot is the addition of a PEI sheet as bed material. 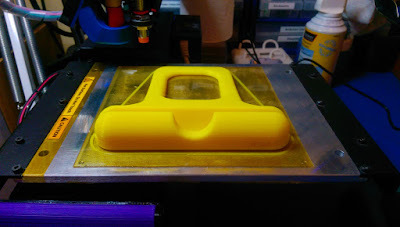 I’d been reading about the lucky Taz mini users that get this as part of the standard kit, and their claims of it’s almost magical qualities in terms of material adhesion whilst printing, and ease of release when the job completes. I must admit I was a bit sceptical at first, but was getting sick of all the glue and copious amounts of very expensive Kapton tape I was getting through, especially when using ABS. The sheet that finally arrived was perfectly square and had no marks on it at all due to excellent packaging and the fact that both side were protected with a thin plastic film. One side of the sheet is smooth and flat and the other has a slight texture. It doesn’t actually make any difference to prints which side you have facing up – the smooth obviously gives a nice glass like finish to the bottom of prints, and the texture side *may* give slightly better adhesion to larger prints. My testing on this was inconclusive though, as it seems that even bed temperature actually plays a much more important role in the model adhesion that anything else. Given that the sheet I bought was just over 1mm thick, it is very flexible and easily can be bent. It’s not easy to break though, and would require a lot of force to shatter or cause a tear due to flexing – way more than I was prepared to try anyway. The sheet can be cut easily to shape and size, and I achieved this by scoring repeatedly with a craft knife and finally cutting along the score with some very sharp kitchen scissors. During the cutting I had no issues with flaking, cracks or small shards appearing – it cut very cleanly. Deciding how to mount it on the bed was a bit of a challenge, as I wanted some versatility in terms of changing surfaces, for example using Tufnol for Nylon printing. In the end though, given how thin it is I went ahead on both machines and stuck it directly onto the aluminium beds using good ol’ 3M468MP transfer tape, which I also bought in 300x300 sheets from Amazon. I simply cut it to size, cleaned the bed with a mild soap solution followed by a polish with an IPA aerosol solvent, and then smoothed the tape down with a stiff card. The adhesive has removable backings on both sides so this is an easy job. Once the top backing is removed though, be very careful not to let the PEI touch the sticky part of the tape until you have it positioned correctly…getting it unstuck is possible, but much harder than you might anticipate and you could end up partially removing the tape from the bed if you’re not careful. I found that the glue used on both sides of the 468MP tape takes a while to set fully (about 30 minutes from exposure to air it seems). Once it is set though, it makes for an incredibly strong bond and you can be 100% confident that you won’t be experiencing any lifting of the PEI or the tape from the bed. Once I had the PEI mounted, I carefully rubbed it down with a soft cloth to remove any tiny air bubbles – this has worked extremely well. So, that’s the fitting done – how does it perform? As I mentioned earlier, bed temperature is the key to using this stuff effectively. Now, I don’t just mean heat it up and away you go – that’ll work in the middle of the bed where the heat is most stable, but not around the edges of the bed – so if you’re printing something large you need to take some extra time to check your bed is evenly heated, which in my case meant changing the bed heater to a higher output silicon version than the stock Nichrome heater I’d been using on one of the printers. Not ensuring even heating for larger objects will result in the dreaded curling and potential print failures we are all familiar with. Now saying that, once you get the bed heating nicely, you can really start to enjoy the benefits of this material. It’s virtually maintenance and preparation free – the only maintenance you’ll need to do is to give it a wipe with IPA before every print. The PEI surface is quite resilient to marking, so as long as you take care not to gouge it if you have to pry up some rock solid PLA with a blade for example, you shouldn't have issues with surface marking. 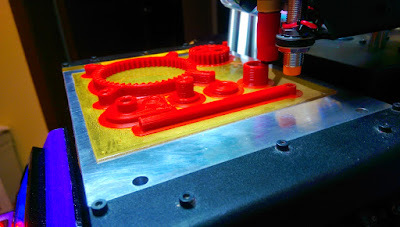 With PLA, I’ve found that a bed temperature of 70c is ideal, even for 100% infill 150x150mm sized prints. No movement, no warping – perfect adhesion. Magical. Except it’s a bit too magical with its adhesion to PLA sometimes and you may have to carefully get a craft knife under a corner of the model to remove it. On the good side though, as soon as you lift even the smallest part of the model, the rest just pops off the bed most of the time – I have yet to really struggle to get a part of the bed made in PLA. For ABS, the PEI needs plenty of heat in order for its magic to work – the best temperature I’ve found is a consistent 100c throughout the print – providing the bed is heated evenly, it will stick and not curl or warp. Here’s where it gets really magical though – to get ABS off the bed just let it cool down to under 40c and the part usually just pops off. If you’re impatient though, a quick blast with a freeze spray (or an inverted air duster) makes it virtually leap off the bed. It’s worth printing in ABS just to do this! 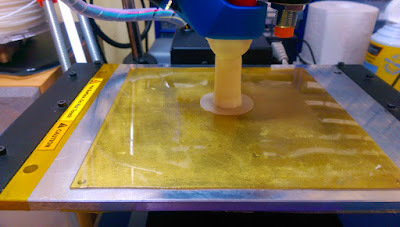 I have found that on very large solid prints (over 60mm base with 4 bottom layers and greater than 40% infill for example) the adhesion magic ends and a thin coat of gluestick is the only option to stop warping. In my particular case, drafts are a big enemy too - my Printrbot sits next to a door, and every time the door opened I was getting loss of adhesion from the model. Gluestick did help enormously in this case though. Must get around to building that bed enclosure. Again, the PEI is easy to clean when using Gluestick - the gluestick is water soluble, so I just spray water onto the glue, let it sit for a minute and wipe it off with a paper towel. A quick quirt of IPA and a polish and it's ready for action again. In conclusion, with ABS, PEI isn't magical. But...and this is a big but...its a lot easier to deal with than Kapton tape and glue. For smaller objects, no glue is definitely an option, and often a brim isn't even required. I've had better success with ABS models since installing the PEI and this is a win for me. Do pay attention to even and consistent heating of the bed though - for ABS you want a bed temperature of at least 90c, and preferably 105c across the entire surface where the model touches it. For PLA, the PEI material is wonderful and the bed requires zero preparation or clean-up (other than the obligatory IPA wipe to get rid of fingerprint grease). 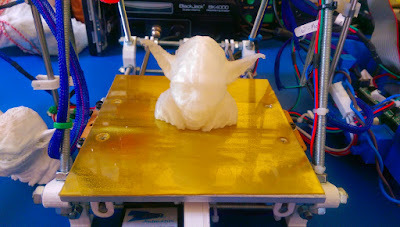 If you only use PLA for printing, you'll wonder what you ever did without it, as the lower maintenance and increase success rate of prints will save you hours of frustration. This weekend I intend to try out some other materials including Nylon printing on the PEI, although I'm not expecting too much success there as Nylon seems to like a fibrous surface to stick too like Tufnol. I also have some Flexible materials and PCTPE, along with some Laywood to try.